I fell in love with the white cheddar mashed potatoes at Ruby Tuesdays and had to make a home version. I found a large bag of baby red potatoes at Costco and used some of the Kraft white cheddar blend that I had left from my White Cheddar Mac N Cheese. My sis-in-law made a similar recipe and used her Kitchen Aid mixer. I was so excited to try and make this! I think I heard the term 'Smashed' potatoes on America's test kitchen. This was the perfect accompaniment for my father-in-law on Father's Day served with my husband's smoked brisket. It was so good! Creamy. Smooth. With a bite of white cheddar. I will definitely make this again. And eat the entire batch. In a saucepan, cover potatoes with water. Bring to a boil and then reduce temperature to a simmer. Simmer potatoes 15 minutes or until fork tender. Drain potatoes and place in mixer with flat beater. In a saucepan, combine milk and butter. Heat over medium heat until butter is melted. 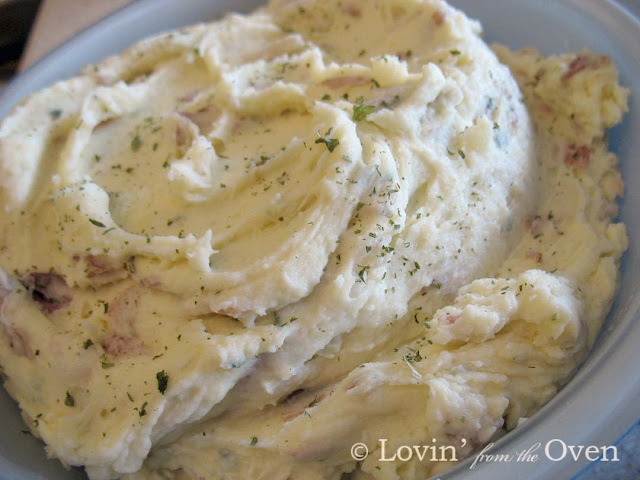 'Smash' potatoes in mixer until smooth. Slowly add warmed milk mixture. Add cheese. Season with onion powder, salt, and parsley. Add white pepper to taste. Reserve some parsley for the top. Wow, these sound decadent and good. Do you own a food mill? I have one made by OXO. Ever since I saw Ann Burrell (Food Network) show how to use a food mill to puree the potatoes (I even toss garlic cloves into the cooking water) I have not had to peel potatoes again, and I can stir in the ingredients. I will try this recipe using my food mill-- so easy! Hand me a spoon, I'm going in!! I would definitely fight to eat the whole bowl. This is one of my favorite side dishes!